Q: What is Computer Architecture? 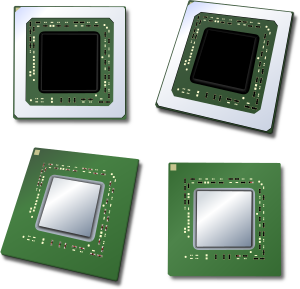 Answer: Computer architecture is the design of computer systems, including all of their major subsystems including the CPU and the memory and I/O systems. Q: Write a short note on Digital Computer. 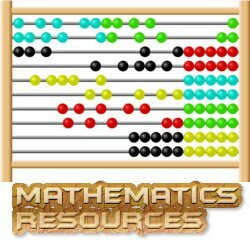 Answer: Digital Computer is a fast electronic calculating machine which accepts digitized input (i/p) information, process to a list of internally stored instructions and produces the resulting output (o/p) information. There are handheld computers such as palmtops, PDAs and smart devices which are designed to be easily carried or even worn by us. A large and very powerful computer system exist that are called 'enterprise systems' and servers at the low end of the range and super computers at the high end. Servers contain sizable database, storage units and are capable of handling large volumes of requests to access data. 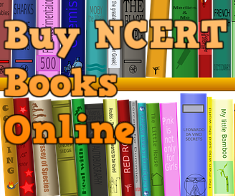 Servers are widely used in education and business purposes. Super computers are used for large scale numerical calculations like in weather forecasting, air craft design, simulation etc. Q: What is Von Neumann Computer Architecture? 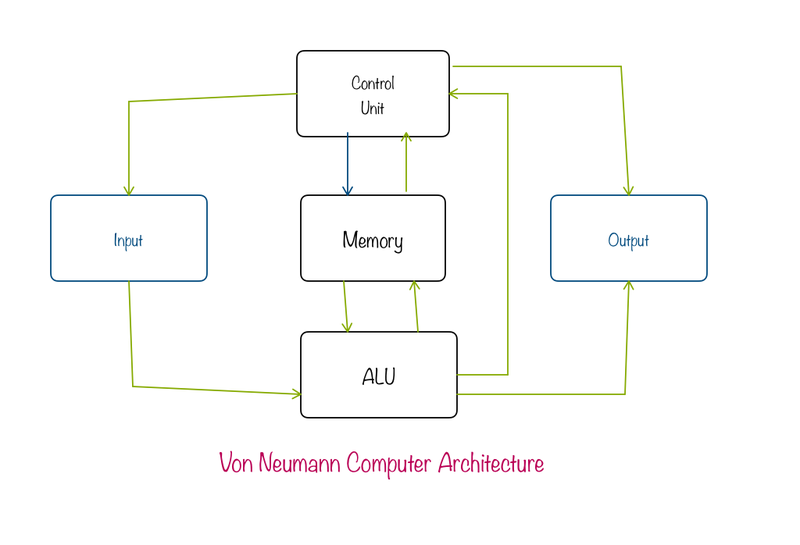 Answer: The following block diagram shows the Von Neumann Computer Architecture. It was the first modern design based on program concept developed by Babbage. It lays down the basic organization of modern computer designs. 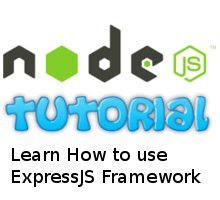 It consists of input and output systems and a single memory system. 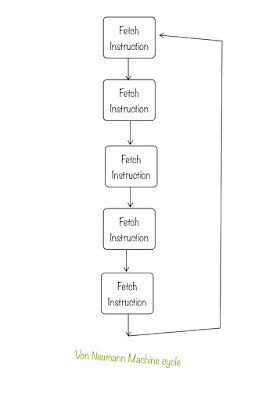 The memory system is used to store program instructions as well as data. 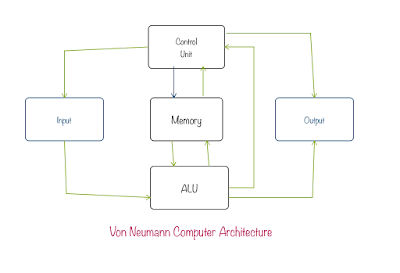 According Von Neumann Computer Architecture to arithmetic Logic Unit (ALU) and control unit (CU) forms the key components of CPU. The original objective of Neumann machine was to solve numerical and scientific computations but it has been widely adapted to business purposes like word processing. Q: Draw Von Neumann machine cycle. 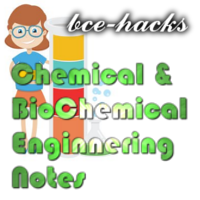 Answer: Von Neumann machine has one path between memory and control unit which is also the bottleneck of von Neumann machines. 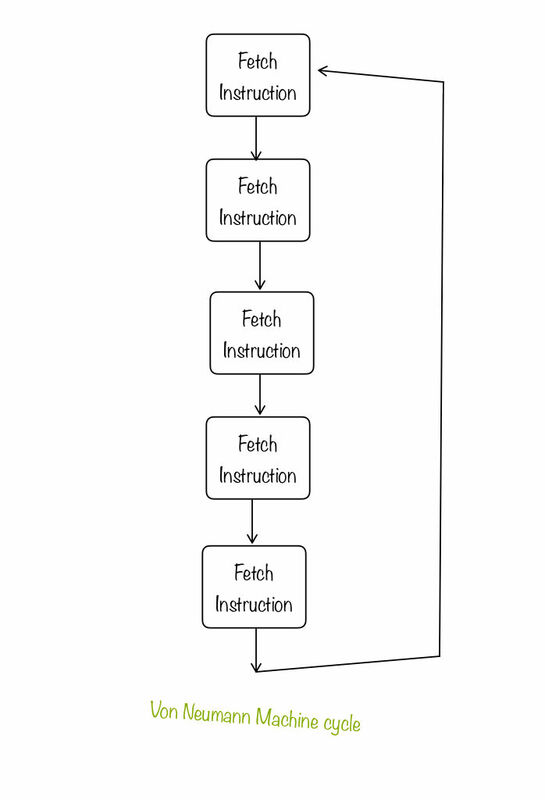 When all the steps are complete for a given instruction only then the CPU is ready to process the next instruction. Q: Name the computer architecture which proposed alternate to von Neumann architecture. Answer: Harvard architecture which proposed separate memories for instructions and data.